This past weekend my dad asked me and the wife up for a BBQ. The only request he had, since he’s not a good cook, was to help him with getting the food done. He wanted to do barbecued chicken, so I told him I’d bring a good rub if he brought the chicken breasts. Bubba's BBQ Rub - Chicken was excellent! 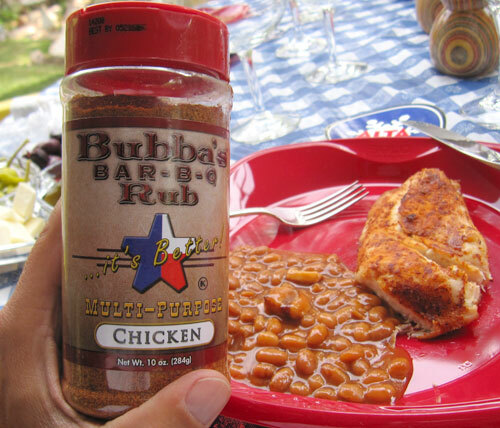 I brought up my Bubba’s Bar-B-Q Rub Multi-Purpose Chicken and just before slapping the breasts on the barbie I rubbed them with the spice. The end result was so good that all of the guests were raving about the taste. In fact, none of the guests busted open the bottles of BBQ sauce which were on the table for them. The chicken tasted so good, nobody wanted to change it! Well done Bubba’s. Well done. I can only imagine how good the chicken will be next time, when I have enough time to do the rub in the morning and let it soak in for a good day before slapping the meat on the grill.